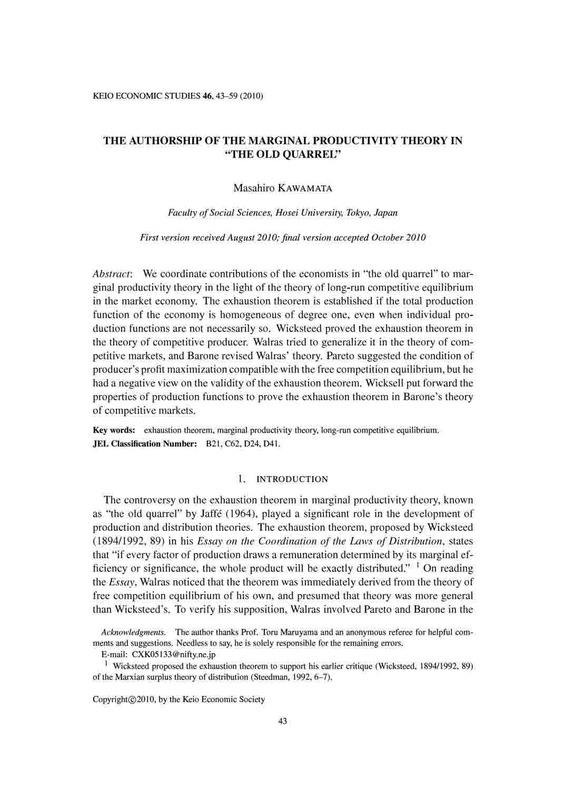 タイトル The authorship of the marginal productivity theory in "The old quarrel"
We coordinate contributions of the economists in "the 0ld quarrel" to marginal productivity theory in the light of the theory of long-run competitive equilibrium in the market economy. The exhaustion theorem is established if the total production function of the economy is homogeneous of degree one, even when individual production functions are not necessarily so. Wicksteed proved the exhaustion theorem in the theory of competitive producer. Walras tried to generalize it in the theory of competitive markets, and Barone revised Walras' theory. Pareto suggested the condition of producer's profit maximization compatible with the free competition equilibrium, but he had ａ negative view on the validity of the exhaustion theorem. Wicksell put forward theproperties of production functions to prove the exhaustion theorem in Barone's theory of competitive markets.